Home Business Banking P7 – What is Chidambaram really worth? 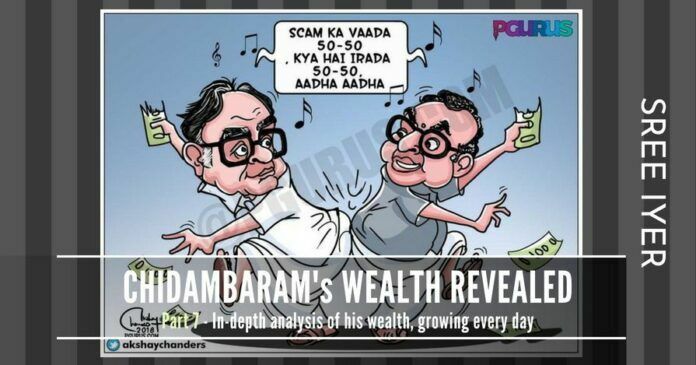 A look at how Chidambaram was the Rain Maker for his party. Finance Ministry must have been a hobby. Parts 1-6 can be accessed here. This is the concluding part. Some are born great, some achieve greatness and some have greatness thrust upon them – thus wrote William Shakespeare. Some are born great, some achieve greatness and some will buy greatness at any cost. I have said this before and will say it again here. It is the burning ambition of every Indian politician to die a Prime Minister (PM), even if for just one day. This is especially difficult for a member of the Congress party, since the eighties – Indira Gandhi placed loyalty above everything else and the fact that some non–Gandhis became the PM was more out of serendipity and luck than sheer ability (e. g. P V Narasimha Rao, who practically ran the government under Rajiv Gandhi). But money can move mountains and minds, especially the ones that matter when the question of who shall lead the country crops up. What is PC really worth? 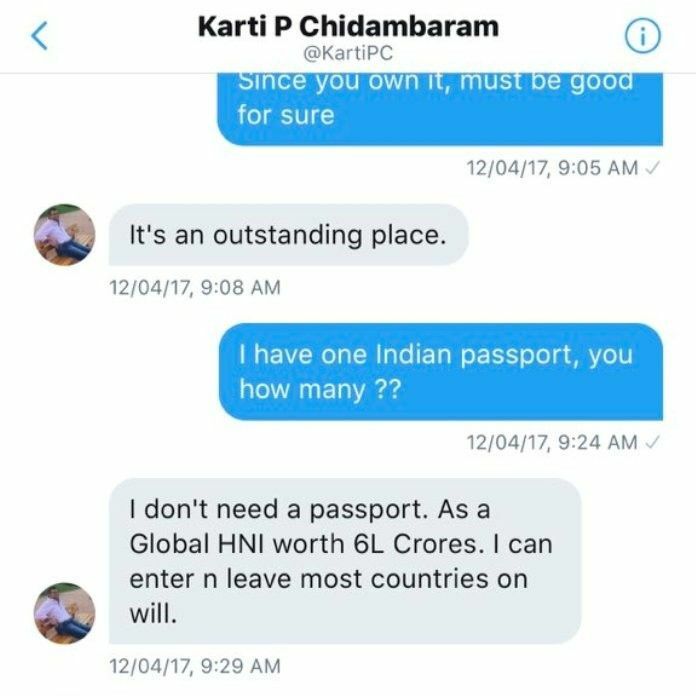 An excellent question that can perhaps be answered by looking at the utterances of his son Karti Chidambaram, who in a rare moment of candor, revealed that he was worth Rs.6L crores ($100 billion). A copy of the Direct Message that he sent to a Twitter user is shown below in Figure 1. Trading scam and the amount of money in question is between Rs.50,000 crores to Rs.75,000 crores. PGurus has a detailed article, listing the various properties that the Chidambaram family has acquired all over the world. The conservative estimate of the value of these works out to be around Rs.20-25,000 crores ($3 – $4 billion). ICICI Bank’s loan to Videocon was Rs.40,000 crores ($6 billion). Several loans from ICICI Bank under Chanda Kochhar have had 10% kickback to her (through her family members). If the Bank CEO got 10% kickback of a loan that was essentially a farce, imagine how much of a cut the top guy in the Finance Ministry, who ordered it, would get! 25% of the loan amount is a conservative estimate. Now do the math – The amount of Non-Performing Assets (NPA)s in the country is Rs.10L crores. 25% of this works out to a cool Rs.2.5 Lakh crores ($40 billion). PGurus wrote about the findings of the Department of Revenue Intelligence (DRI) on a huge scam in coal imports from Indonesia, during the period 2008-2010. In a nutshell, it is an instance of the over-invoicing of coal. Even though the ships directly land in India from Indonesia, the bills were routed through fictitious and benami firms in Singapore, Hong Kong and Dubai before landing in India. This is just one instance – there are several that happened in the UPA regime. 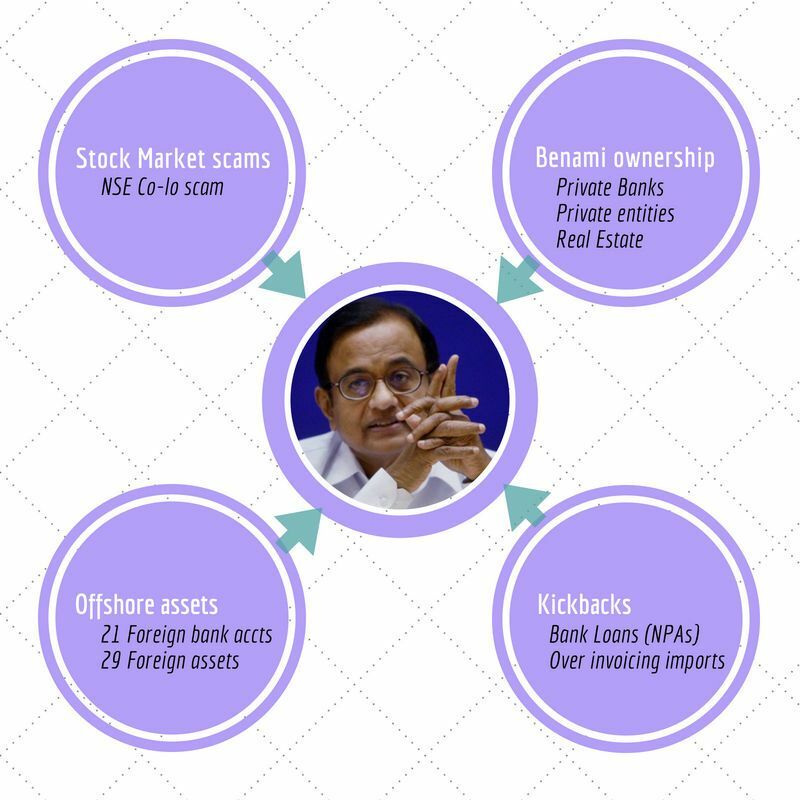 Looking at the ownership structures of some of the Private Banks and entities like the National Stock Exchange (NSE), it appears as though Mr. Chidambaram took full advantage of Participatory Notes to hide the real owners in such entities. ICICI Bank has 40% foreign ownership and HDFC 76%. NSE has close to 34% foreign ownership. As ICICI kickbacks to Chanda Kochhar emerged, no class action lawsuits happened in the United States (where ICICI is traded as an American Depository Receipt (ADR)). This is a clue that the real owners of such entities are in fact high net worth individuals from India, who have enough clout to control what the Indian government can and cannot do. Witness how no action was taken against Ms. Kochhar and her family till now… Asking her to go on a leave of absence appears to be a gentle nudge to step aside till the heat cools down. Much of the action in these entities happened under Mr. Chidambaram’s watch. Looking at the valuations of the above entities and other as yet un-earthed firms, and if Karti Chidambaram is right, that works out to least Rs.2.5L crores invested in such ventures. The estimates above need to be tracked and verified by the investigating agencies – it is not going to be easy because much of it is stashed away abroad and with every visit, Karti Chidambaram is creating new walls of obfuscation by adding more layers. But frankly, the ED and CBI are looking at peanuts when they are trying to go after the Chidambaram family on INX Media and Aircel Maxis scams when there is a wedding feast that is visible to everyone except them. Previous articleIn conversation with an Economist Prof. Nalapat – Can a Stock Market Crash be engineered? The simplest thing the Govt can do is to black out chiddu, who alone is equal to 10 billion Virappans, from all print and electronic media and freez all his and his family member’s bank accounts to end his ‘purchasing’ power so that he does not get bails so easily and is tried for amassing 100 billion worth black money ‘wedding feast’ and not for making a few extra coins for buying peanuts! I doubt any such blockade will succeed. I wonder if it is right to attribute the entire blame to one person or family. Quite likely, many nations will be willing to shield any and every entity involved in this game. People need to be more alert and vigilant at every level to minimise these games of money. If India continues on the path of high cost of education/ wealth, corruption will only grow faster and spoil the entire society. 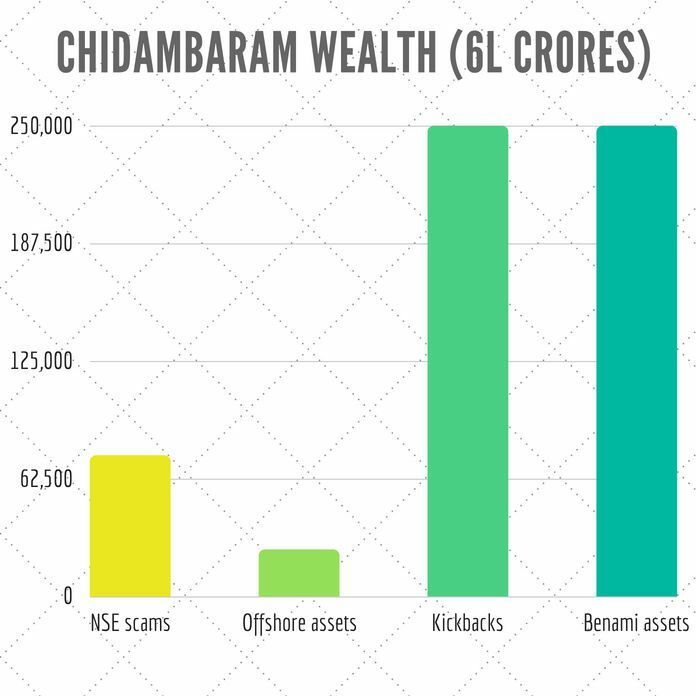 This Chidambaram black assets are all known to Indians, but Modi seems to wearing dark glasses & ignore all information & protect Khangressmen. The Arun Jaitely & his band of sycophants in the finance ministry are all corrupt & need to be thrown out complete. There is no recourse to justice to common man. Indian democracy is totally failed by its leaders. There is no glucose for voting in elections. this article, makes easy understanding-the-basics of : the huge-scale-of financial-improprieties-committed, directly-or-indirectly, even to the financially-uninitiated, such as myself. = to realise similarly, ‘WHY-and-HOW’ to extricate the Nation, from the cancerous-clutch of ‘Blackmoney’, one of the ‘symbols’ of ‘quickandeasy-gratification’! > the undercurrent of the still-prevailing Corruptive_so-Corrupting-the-Corruptible COLINKING, continuing-unabated, in all-walks-of_LIFE! (ii) HR management, safeguarding every worker, from grevious malicious acts of EGOs-on-Chair, such_as: (a) improper pressurisation by ‘the boss’, to succumb-to-malpractice; and so, (b) from the smooth-operators, promoting favouritism, nepotism – safeguard from these demolarizing corrupt-practices of the Boss(s)-on-Chair! (1) The polished english-speaking, so well-heard, and now revealed as the rain-making PC, the past FM, of the previous regime, so well-loved by the ‘ala-command’ of his party! (i) WE the People of India, NationFirst, must all read this, analytical article, to easily comprehend the GRAVE anti-Nation’s (so anti-People’s) acts shrewdly committed by PC, in trust under last UPA Government of India, with the blessings of his political-party’s High-command! for immediate-future, with hope-and-prayer, to the Supreme Court of India (SCI), to pass an umbrella order, to all courts, to expidite, such-files, with grave-financial-outcomes, if left-to-linger-on… for many-years, the bailed-out, left-free-to-continue-to-influence-others, on similar-ill-begotten quick-and-easy-paths…, or, waiting-for-the-matter to-dilute or die-down! (4) Also, thanks for the proactive succinct Comment of Vishwanath Kishnamoorthy’s on this contemporary_analytical-article, pointing to the grave end-fate of this grave-financial-outcomes-case, if habitually, draged-on-for years + the subtle-sarcasm on the not uncertainty of purchasible-results! = so adding to the burden of ill-FATE, by ill-ACTs ( of Ommision-and-Commision) on India, NOW one-way to Nation-RESSURECT, by a pledged NewIndia against Corruption / CorruptPractices! HOPE-and-PRAY, will-not-be-left-to-happen, by the reforming SCI, and NaMo, the PradhanSewak of Bharat! The series of allegations against PC family mounting, it is essential a separate Investigating Agency and an exclusive bench of Supreme Court is required to try the cases. The quantum of black money hidden in layers overseas and under Benami names all over the world by not just PC but baramati and others makes only option viable for recovery of black money. – nationalisation. A case by case proof and trial is impossible and likely to last a few hundred years. A simple 64 Crores bofors could not be concluded in 30 years! Is the common man willing to receive cash digitally?